Fulham Road, the home our very first London showroom, is real treasure-trove of design shops for anyone with a love of all things interior. Since we opened our Fulham Road doors in 2013 we have discovered a whole host of interesting and unique interior design businesses nested in amongst our neighbours. Referred to as the ‘Chelsea Cross Destination Design’, the area is well-known for its close knit community of specialist designer showrooms and from this exclusive selection we’ve put together a quick guide below of a few of our favourite stops along the way, perfect for anyone with a current project on the go or just a love of design! First up (of course! 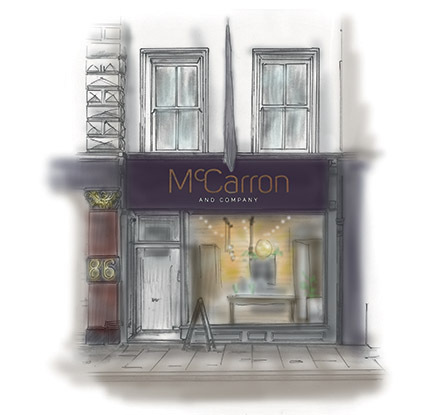 ), starting out at the McCarron & Co showroom at 84 Fulham Road, we have a whole host of inspiring kitchen and interior displays on offer. The showroom provides two (and some would even argue three) floors of beautiful hand-crafted British made fitted and freestanding furniture sitting alongside top appliance brands such as Sub Zero and Wolf, Gaggenau and Miele. McCarron & Co offers a comprehensive bespoke design service for all rooms in the house and our experienced design team there will be more than happy to offer relaxed and informal design advice and guidance with your project. Next up on our list is Valerie Wade, located on the corner of Fulham Road and Onslow Gardens, in the heart of the fashionable “Chelsea Cross” design destination. Known for high-end, unique furniture and objets d’art, the boutique has gained a loyal customer following – including several well-known celebrities. Valerie, a former fashion editor of the Sunday Times Magazine, has a refined taste in beautiful one-off items for the home. “I only buy items for my shop that I would have in my own home. My focus is very much driven by fashion,” Valerie says. A short stone’s throw on from Valerie Wade, head on to Colefax & Fowler, the internationally renowned designers of fabrics and wallpapers. Renowned for their classic English appeal, Colefax and Fowler has an elegance and subtlety that is admired the world over. Alongside the Colefax & Fowler collections, the Colefax group also offer a range of other luxury brands such as Manuel Canovas, Jane Churchill and Larsen, each one with their own unique signature style. The showroom is packed full of fabric and wallpaper samples to browse through and you will be spoilt for choice when it comes to choosing textiles for your project. If you are feeling inspired by luxury design and unique pieces for the home, we highly recommend a trip to Phillipe Hurel. With a design legacy spanning over 100 years, this exclusive French furniture and design brand has quite rightly earned its place in the circle of Living Heritage Companies. Known for harmonious forms and luxurious materials, the showroom is packed full of inspiring and original pieces. And last on our list but by no means least, we would recommend that you stop into C. P. Hart to browse their inspiring collection of luxury bathrooms and sanitaryware. A blend of inspirational displays and cutting edge technology, with expert advice and design consultancy on hand for both professional and retail customers.